The above images of the Mink Building in 1998 and 2006. It was originally operated as the Bernheimer-Schwartz Pilsener Brewery Company until Prohibition intervened in 1903. In 1930, the Interborough Fur Storage Company used it for storing the furs of wealthy downtown matrons. Janus Properties purchased the rotting and crumbling property at the end of the 1990s and restored it into a Harlem gem. SoHarlem shares space on the 3rd floor of the Mink Building. Mission: To support racial equity and employment in Harlem by incubating creative enterprises that incorporate sustainable business models. Vision: To sustain a collective of designers by providing space and support services along with a platform for sharing their expertise by training local community members in garment construction providing potential apprenticeships in the fashion industry. 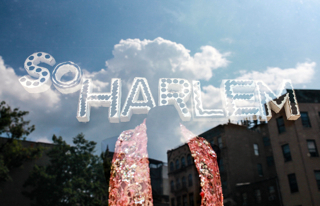 Program Focus: Since SoHarlem’s inception, we have experimented and explored a range of cultural industry opportunities. Many creative entrepreneurs SoHarlem has assisted have established their own cottage industries. Today, in response to the needs expressed by the creative community, the Cultural Industries Incubator focuses on developing micro businesses related to the fashion industry. The Cultural Industries Incubator also addresses this industry’s continued struggle with racial equity. The greatest demand from creative entrepreneurs in Harlem has been from designers of color who have limited access to affordable work space, and who cannot afford historically expensive apparel services that were once common in the Garment Center. To learn more about our Designers' Studio click here.